View the super-size gold nugget gallery with lots of pictures and information about the gold nuggets. We could not have made it more simple to help you get that coin or note and make it your own. 30% down, 30% in 30 days and the remaining balance in 60 days. 5% restocking fee for returns. It has never been a better time to consign to Jhon E. Cash. Click Here for all the information you'll need to get your currency/coins sold and top dollar for them in your pocket. Click Here to answer all of the questions you may have about us, how to purchase, how to consign, ect. View the largest and ever expanding gallery of high-end and Monster rainbow toned Morgan dollars, an informational guide on how to tell natural vs. artificial toning, learn to price toned Morgans, view auction results of rainbow Morgans, and view what characteristics to look for in high-end toned rainbow Morgan dollars. Who wrote the Pledge of Allegance? If YOU have these currency notes or coins, WE want to buy them. Over 1000 of our clients post their want lists Right Here. Dealers may also find this useful. Click here to send us suggestions about how we can make our site better. Have an idea for a cool feature you want to see implemented? Tell us. 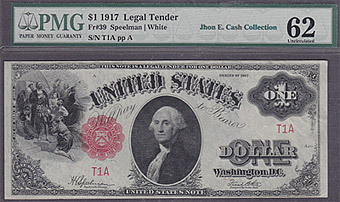 Jhon E. Cash Currency, Coins, and Collectibles is an eBay presence with 100% positive feedback. We offer weekly auctions and professional listings to get your consignments noticed on a grand scale. Read more about it. NGC - Numismatic Guaranty Corporation is based out of Sarasota Florida and is one of the top 2 grading companies for US Coins, Patterns, and Medals. It is one of the two preferred grading companies by Jhon E. Cash. PCGS - Professional Coin Grading Service is based out of Newport Beach, CA and is one of the top 2 grading companies for US Coins, Patterns, and Medals. 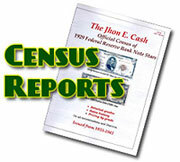 It is one of the two preferred grading companies by Jhon E. Cash. Collectors Universe Coin Forum - This is the pulse of the Numismatic market. There are no featured coins at this moment.